TY Thursday: Post-Donation Thank-You–on Your Website! Congratulations! You’ve cultivated your donor, and she has just gone online and made a generous gift. Now, post-donation, you want to thank her as personally as possible, as soon as possible. Just because a donor has made a gift to your organization, it doesn’t mean you have won their heart. Not forever. Maybe not even for today. All online fundraising tools will let you send a receipt to your donor automatically, to let them know their donation actually went through. But that’s the equivalent of the cashier handing you a receipt after a purchase. It’s minimal and impersonal. Your nonprofit can do better than that! Some tools, like PayPal, won’t. But–PayPal will let you return the donor to your website after he or she makes a donation. So, why not set up a post-donation thank-you page that shares all the love with the donor, right there on your website? Invite donors to follow you on social media. Invite donors to watch a video. Gather info with a little survey. Ask just two or three questions on the thank you page, such as how they found out about your charity, why they donated, and how they want you to communicate with them. Connect your donor with resources. Gather feedback. Explain to your donor that you always want to improve your service and ask her to help by leaving feedback about the donation process itself. Provide testimonials from the people you serve. There’s no better way to reassure the donor that his decision to give was a good one than by listing a couple of testimonials from the people you help. Invite donors to something special. 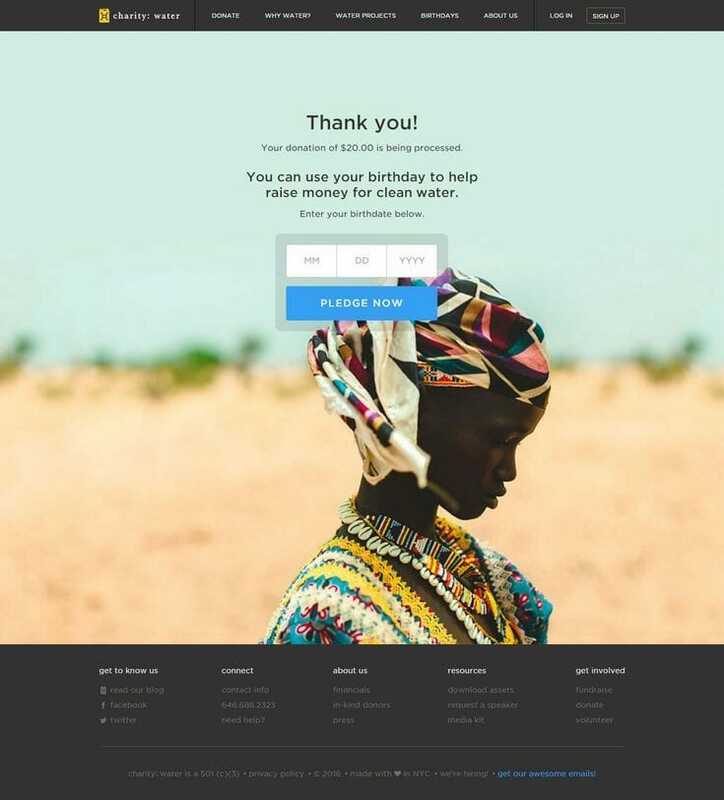 Remind your donor of an additional way to give (as charity: water does in the thank-you page pictured above). Add an email newsletter subscription option. Highlight impact. By closing the loop on the donation, you ensure that your donor knows that your organization is making a difference because of their investment in your cause. It doesn’t take any more technical knowledge to set up a post-donation thank-you page than to add any other page to your website. So, why not give it a try? See if your donors appreciate it!